Be prepared to travel to the Cyclades archpelago during the golden age of the ancient Greece. With the blessing of the Gods of Olympus and the support of Mythological Creatures, recruit troops, build ships, create fortresses and construct metropolises. The struggle to bring your people to their highest glory will be legendary! With Cyclades, Bruno Cathala and Ludovic Maublanc (Mr. Jack, Dice Town) reinvents development and conquest games. In a ninety minutes game, live through an incredible adventure in which soldiers, philosophers, mythological creatures and gods are common. Cyclades is one of the first board games I played after years of wargaming and RPGs. I grew up with Risk and Monopoly and the like but moved on to other forms of gaming as I got older, and in the meantime left board games behind. About two years ago I got the chance to sit down with some friends and learn the game Cyclades, and it pulled me into the hobby of more advanced board games. Because of that, it is a game that I recommend to everyone. Cyclades is a board control game, similar to Risk in that players move troops around a map attempting to gain control of more regions. This makes the game style easy to understand for most any player. The map is broken up into islands and sea locations that give players access to their turn-by-turn income and open spaces to build different structures. The map is semi modular, with four different distinct options that are changed based on the number of players. More players means a bigger map with more available areas. Each turn begins with players using their gold to bid on the favor of the Greek gods Ares, Poseidon, Athena, Zeus or Apollo. The number of gods available to bid on is always equal to the number of players. Each god gives a different benefit to the player who earns their favor. Poseidon lets the player build and move ships around the seas to bridge the gap between islands. Ares gives the player more troops and the ability to move troops across islands that have been bridged by ships. Each god also allows the controlling player to build a specific building with certain benefits. Apollo is always available to all players, with each player choosing him receiving at least one gold and the chance for more monetary rewards. This struggle is one of the game’s central mechanics. The game is won when a player ends a round controlling two metropolis buildings. A metropolis can be acquired in one of three ways. If a player has one of each of the four unique building on the board they are immediately replaced with a metropolis. If a player ever owns four philosopher cards (bought when you control Athena) they are immediately traded in for a metropolis. Last, a player can use troops to conquer and island with a metropolis already built there. This means that each player will continue to fight for the favor if different gods in each turn to diversify their holdings and military options. This makes the game very unique as conflict occurs off the battlefield and new tactical options become available based on which god you control in a given turn, and which god you plan to follow in subsequent turns. This is all further complicated and enhanced by the mythological monsters deck. Each turn a new monster is revealed (up to three total) that has a unique one-time ability that can be used by the active player if they have the money to purchase the monster card. Some monster give gold or move troops, others destroy building or protect items. Zeus allows players to build temples that reduce the cost of monster cards. Cyclades’ great strength lies in the variables on the board. The order of god on the board, gold available, monsters available, and the threat presented by other player all factor into the decision making. The theme of competing for the gods’ favor is very well executed in their differing abilities and tactical strengths. Direct combat, sneaky use of monsters, and staunch defense are all valuable play styles. The games components—board, figures, cards and tokens—are all very high quality. Their art and durability are top notch. The rule book is short and easy to understand, and each player is given a game screen with summaries of every item in the game. You really get your money’s worth in both game play and production value. This game gets a solid A rating and is highly recommended. The above statement comes as a bit of a surprise to me. In fact, I like this game a lot. (2) it adds (a little) wargaming to a Eurogame (wargames aren’t typically my favorite genre). What wargaming there is doesn’t overwhelm the game, but adds a little extra element of risk and planning. The Eurogame portion presents itself more in the auction mechanic, which will be very familiar to fans of Amun-Re. Only one person may win the favor of a god each turn (other than Apollo, which gives money instead of requires it). A person will bid some amount for the god they want the favor of, then the next person choose a god to bid on. If you want the favor of a god that already has a bid, you must outbid that person. If someone is outbid, they must immediately make another bid, which cannot be on the god they were on when outbid. It’s a great bidding system. Each god gives different favors, and allows you to build different buildings that give you benefits as long as you own them. When you have one of each (of four) buildings, they become a metropolis. Ending a turn with 2 metropolises (3 in a 2-player game) gives you the win. There is an added element to buildings, you must have a place to put them. The gameboard represents the Cyclades chain of Greek islands, each island only have so much room for buildings. This is where the war portion can come in. You can attack and conquer other islands using Ares, so long as your fleet of ships (granted by Poseidon) can reach the island. I prefer the game with more players (for instance, I like 5 more than 3). 2-players was also fun (each person bids on two gods per turn) but felt like a different game to me (though following almost all of the same rules). I’ve found a game takes more than the 60 minutes advertised (90-120), but is well worth it. If there is a downside, it can happen where one player finds themselves in the role of keeping another player from winning. Often, you can see which god someone needs in order to win the game, and players that are behind tend to be the ones jumping in to keep the game going, instead of aggressively following their goals. This game borrows mechanics from many places, and ends up with an unique experience that keeps me coming back. What’s that sir? You were never really into auctioning? What if these have bloody consequences? Never was too much into war gaming? What if you could buy the service of a Kraken to eat the enemy ships at your shores? Cyclades invites you to a Mythological buffet of game mechanisms, each spicing up the previous. Get a napkin. Everyone starts with a small army occupying a few islands in the Cyclades archipelago. This is not enough for the ambitious leader you are of course, so you will try to expand to more terrain and build impressive metropolises using your hard earned cash to win the favor of the godz. After a small (re)setup, each round starts with an auction for the favor of one of the Greek godz. This goes quickly around the table until everyone is (or has to be) satisfied with the god that will do their bidding for the round. This is followed by players, in oder of the godz they’ve picked, executing the accompanying actions. The player who won Poseidon will be able to move ships and start sea battles. Zeus can give you Priests and reduce the cost of future auctions etc. This is mixed with the Mythological creatures that are on offer as well. They give the game its flavor and ever changing tactics by offering one use power-ups for the round. Go round and round until someone manages to squeeze out a second Metropolis. This is one of the best looking games I own. If opening the box and looking through all the shinies doesn’t cause you to create an embarrassing amount of saliva, maybe you should reconsider your geek status. Besides being pretty, every tiny piece is high quality. Everything from the main board, the voting tiles, the coin, the miniatures. Oh! The miniatures. Why is it that each player gets different models for their boats and soldiers? No reason. Other than drowning you in theme and atmosphere. The player screens help here as well. Each player has different artwork to instill fear in their opponents. Details details details. This game is an ode to boardgaming. Everything has been done with big scoops of love here. Cyclades is a little bit of everything. It all works together like a Swiss watch and then manages to merge it with the theme as well! That is a hat’s off and deep bow from me. But this might also cause you to be disappointed that a certain element isn’t meaty enough. Not really crunchy enough for number-crunchers or tactical enough for war-tacticians. For sure its plenty if you are the type that wants to taste a bit of everything from an exotic buffet but doesn’t want to end up with too much on his plate. 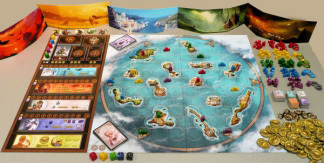 Cyclades takes place on an archipelago off the coast of ancient Greece. Players become the leader of a great Greek city-state, namely Sparta, Athens, Corinth, Thebes and Argo. Players move their city’s armies and fleets, build structures, use mythic creatures and seek favors from the Gods in their quest to dominate the Cyclades archipelago. The theme is very well represented in the game. The object of the game is to acquire through conquest, building or other methods two Metropolises. Cyclades is for 2 to 5 players ages 13 and up and plays in about 100 minutes. The game has measures to scale for fewer players; however, I would recommend Cyclades for 4 or 5 players. The components are excellent. The board is double-sided and has two halves which are put together to form different boards depending on the number of players. The boards are mounted on thick cardboard and have very colorful thematic artwork. There are thick cardboard tokens and plastic playing pieces. The large size cards are marginally durable and have great artwork. The rulebook is 6 pages and fairly well written and organized, and contains many examples of play. Set-up for Cyclades is easy and fairly quick. Each player receives a reference screen, their troops and fleets, and five starting gold. The board halves are placed together per the number of players and then starting troops and fleets are placed for each player according to the set-up diagram in the rulebook. The mythological creature deck is shuffled and placed on the board along with the priests and philosophers. A starting player is determined and you’re ready to play! The top card is drawn from the Mythological Creature deck and placed in the leftmost slot on the board. There are three slots on the board. When a new creature is drawn all creatures already on the board move one slot to the right and eventually are discarded if not used by a player. A player can use any of the three creatures on the board as long as the indicated amount of gold is paid. Any temple the player controls reduces the cost of the Creature by one gold per temple to a minimum of one gold. The four God tiles are shuffled and randomly placed in the God spaces on the board. Some Gods are not available depending on the number of players. There is a tile for Zeus, Poseidon, Ares and Athena. Apollo has a permanent space on the board. The God tiles are mixed every turn because it determines player order for the Perform Actions step. The player who wins the favor of the topmost God goes first and then proceeds down to Apollo. Each player receives one gold for each prosperity marker he controls. Players seek favors from the Gods through an auction bidding mechanic. In turn order, the players place their offering token on the corresponding space for a God they wish to seek a favor. The offer is made in gold. If a player is outbid, then he immediately replaces his offering token to another God. He cannot place his token on the God he was just outbid on. The bidding continues until all offering tokens have been placed, and then each player pays the amount of gold corresponding to their offer minus 1 gold for each priest the player controls to a minimum of one gold. Zeus: The player receives one free priest. The player can obtain an additional priest by paying four gold. A player can also build a Temple for two gold apiece. All buildings are constructed on an island the player controls within the solid white lines on the board. If a player does not have space to place a structure, then he cannot build. Athena: The player receives one free philosopher. The player can obtain an additional philosopher by paying four gold. Once the player has four philosophers he must return them to the deck and construct a Metropolis. A Metropolis is placed on an island the player controls within the dashed red lines. If there is no space to build the Metropolis, then the player must destroy building(s) to make space. A player can also build a University for two gold apiece. A university does not give any benefit accept that it is one of the four buildings needed to construct a Metropolis. Once a player has constructed a temple, university, port and fortress, then the four buildings are removed and replaced with a Metropolis. Poseidon: The player receives one free fleet. The player can obtain an additional 1, 2, or 3 fleets by paying 1, 2 or 3 gold respectively. Fleets are placed on sea spaces adjacent to an island the player controls. A player can also build a Port for two gold apiece. A port gives the player’s fleets a +1 defense combat bonus if the fleets are in a sea space adjacent to the port. The player can also pay one gold to move the fleets in one space up to three spaces. Ares: The player receives one free troop. The player can obtain an additional 1, 2, or 3 troops by paying 2, 3 or 4 gold respectively. Troops are placed on any island the player controls. A player can also build a Fortress for two gold apiece. A fortress gives the player’s troops a +1 defense combat bonus if the troops are on an island with a fortress. The player can also pay one gold to move the troops on an island. The troops can move any number of sea spaces to another island as long as the player has a fleet in each sea space. Apollo: The first player to activate Apollo receives one gold and a prosperity marker. The prosperity marker must be placed on an island the player controls. Other players that activate Apollo receive only one gold. If a player controls only one island, he receives four gold. During their turn players can also purchase Mythological Creatures. There are 17 Mythological Creatures such as Medusa, Chimera and the Kraken which grant a host of special abilities such as destroying troops or fleets, obtaining gold, and destroying buildings to name a few. Once purchased, the Creature is used immediately. Combat in Cyclades is straight forward and quick to resolve. Whenever a player moves either his troops or fleets into a space with enemy troops or fleets respectively, combat begins. Players simply add up the number of troops (or fleets), and adds the roll of a special 1d6 to get his total. Defenders also add one for any fortress (or port in case of a fleet battle) to his total. The lower number loses a troop (or fleet). The battle continues until someone retreats or is destroyed. Even if a player obtains two Metropolises, the game does not end until the current cycle is complete. This gives players a chance to take a Metropolis away from the player who has two of them before the game ends. If a player has two Metropolises at the end of a cycle, then he wins. Ties are broken by the player with the most gold remaining. Cyclades is an easy game to learn but takes a few plays to learn the tactics. In my opinion, Cyclades is a medium weight game and I would not recommend it to casual gamers. There is a lot of strategy in what amount the player offers to a God, which God he chooses to make an offer and how he uses the ability of the God he has obtained. There are clashes between player’s armies and fleets, and the Creatures also give an element of screw your neighbor so player interaction is very heavy. In fact the end game can get quite crazy. Players need to keep tabs on opponents’ situation and be ready to deny them the victory while simultaneously working to achieve victory themselves. The knock on Cyclades is that often times the game does not end well. A player with a lot of gold on hand can use Zeus to troll through the Mythological Creature deck to find a Creature which will win him the game. There are a few Creatures which in certain situations can give a player the victory, Pegasus is the most common. Pegasus allows a player to transport troops from one island to another without the use of fleets. I understand this concern, but the Creasures are meant to be powerful. Players could House Rule that Zeus’ ability can be used a maximum of three times. This may also be rectified in the expansions. In any case, Cyclades is an excellent, fun game with great theme play. I strongly recommend Cyclades to avid and power gamers. This game is so awesome that I don’t know how to properly describe it. It’s simply awesome . Yes ,there are some little unbalanced elements and yes , there are always people who’ll not like it so much , but for me there is nothing better than having complet set (basic game with all expansions) of this game . I played it like 150 times and every single game brought another experience than previous. If you’re considering buy this game , just do it ! I gurantee you, you will not be disappointed ! Played my first game of Cyclades last weekend and man was it fun. First and foremost this was one of the few games I’ve played where the theme really fits the mechanics and you really feel like you are a part of the game. Whether you are trying to gain one of the gods’ favor or summoning a monster to help you thwart your enemies it all feels good. There are lots of ways to play and many strategies to use in order to win. I also loved the the game board and pieces. Each army has its own look and style both their warriors and their ships. If you like a game with a strong theme and many ways to go about winning then give cyclades a try. It’s tons of fun and pretty easy to learn. So go out and conquer the Greek isles and show Zeus what you are made of. Cyclades is very easy to learn, has amazing components, and has both elements of Euro bidding and Risk like wargaming. In addition, creature cards can add some varied gameplay and turn the tides in an instant. Rule book could use a little more organization, but it well illustrated and generally easy to understand. Cyclades successfully combines euro game style with ameritrash feel. It has auction/bidding, money management, dice rolling, combat, beautiful artwork and great components, and a great theme to top it all off. Fantastic game. This game is like a Euro with Ameritrash trappings. It’s one of the best 5-person games out there. It’s a little complex for kids, but it’s not hard to learn. It’s strategic, but fun. I highly recommend it. Love this one, took a while to get it to the table but once I did my group wanted to play it again. Fantastic components and beautiful artwork. Best way to describe this for me would be like a much better version of Risk in Greek Mythology with a great bidding mechanism. Cyclades is an awasame game with great componets and great mechanics. It’s a very simple game with good rules and a fine mix of euro game rules. Recommended for no gamers too. Add a Review for "Cyclades"